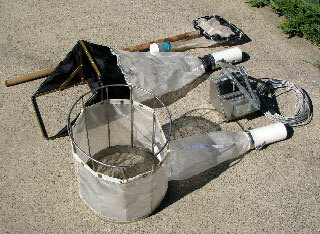 The Aquatic Biology Associates D-frame kick-net can be obtained from Research Nets in Bothell, Washington (phone 425-821-7345 or HalsteadJA@aol.com). The kick-net frame is 30 cm wide X 20 cm tall. The bag is made of 500 micron Nitex® netting with a heavily reinforced abrasion collar. A cut-off plastic bottle is sewn into the tip of the net to allow easy emptying. Ask for Bob Wisseman’s kick-net design, and specify 500 micron Nitex® mesh for the net. Ask for a wide mouth 500 poly bottle. Research Nets makes the kick-net with a wooden handle. With some modification, a telescoping, aluminum handle can be fitted to the frame for easy transport or shipping. Be aware that the D-frame kick-net sold by many scientific and forestry supply houses is intended for qualitative collecting and classroom use. It has coarser netting with a non-standard mesh size. A net with 500 micron Nitex® netting is required for quantitative studies. Hess and Surber samplers are available from several sources. Research Nets has perhaps the best price and design. Make sure to specify the mesh size required for your project (i. e. 500 micron). An option worth considering is a detachable collecting bucket fastened to the tail of the collection net, which greatly facilitates emptying of the sample. Small holes in Nitex® nets can be repaired with Aquaseal®, Shoe-Goo 2® or an equivalent. This type of glue is available at many sporting goods stores and dive shops. Larger holes can be repaired by sewing with a nylon thread. Replacement nets can be ordered from Research Nets. Dredges are used to sample the invertebrate communities of fine grain sediments in lentic waters and in slow moving streams and rivers. Ekman and Petite Ponar dredges are commonly used. These are available from Wildlife Supply Company or forestry supply catalogs. They are expensive.